Port Cunnington Ratepayer Association (PCRA) Board members David Keeley and Michael Green attended Council earlier today for the public hearing of the Haystack Bay – Grant application. 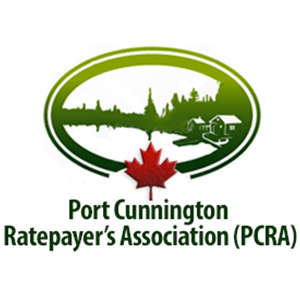 They spoke to this application on behalf of the PCRA; reading into the record a letter from the PCRA. Michael and Dave report that there were many residents present who also spoke and expressed concerns with this application. The main concerns from the public were the road traffic, boat traffic, water quality, fishery habitat and impact on adjacent land owners. As per the staff recommendation within the application’s report (#5(a)(iii)/8/9/16 – Z 19/16 LOB (Grant-Haystack Bay Marina) Report), Council deferred their decision. No date was identified for the application to return to Council. The applicants were advised to provide additional supporting documentation/reports prior to any future consideration of the application by Council. Here is the resolution to defer for the By-law Amendment Application Z 19/16 LOB (Grant – Haystack Bay Marina). Should you have any questions please contact the Township office.